This is a very quick post to let you know that my friend and author, Julian Mortimer Smith has a new story out in the December issue of Urban Fantasy Magazine. For those of you who don’t know Urban Fantasy, it’s available as a pay-what-you-want download and is a really great source of new fiction as well as non-fiction and reviews. For those of you who don’t know Julian Mortimer Smith, he’s a Canadian writer of weird and, I think, really quite wonderful stories and is well worth a read. If you don’t want to pay for Urban Fantasy (although you can download the latest issue for as little as a penny! ), why not check out Julian’s short Barb-the-Bomb and the Yesterday Boy which you can read for free over at Daily Science Fiction (another great source for new short form SF). Well, that’s all from me for now. Unless you have been living under a giant space rock for the last 24 hours, you are probably already aware that yesterday, Wednesday, November 12 2014, the European Space Agency’s Rosetta mission successfully touched down on Comet 67P, the first ever human-made object to land on such a body. Welcome to a comet: The first ever image from the surface of a comet taken by Rosetta’s lander Philae. The media response has been staggering and today #CometLanding is still trending on Twitter all over the world. All this public interest, and of levels normally reserved for flashy NASA missions, is partly because Rosetta is an amazing achievement and partly because ESA did such a great job informing their global audience about the extent and potential of the endeavor. I blogged about the inspiring sci-fi short film ESA released to promote the mission here, and even though I am over a day late, I thought I’d better follow that up with a few pics of the historic landing itself. 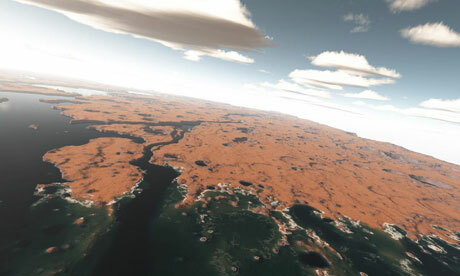 You can find out more information about the mission along with links to more pics, videos, Twitter, Facebook, Flickr and so forth at ESA’s official Rosetta portal, here. 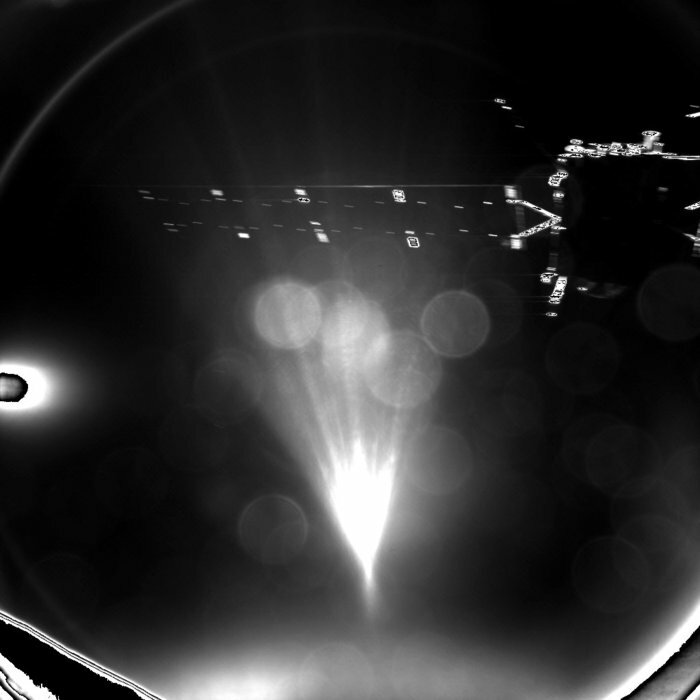 The first panoramic image from the surface of a comet showing a 360º view around the point of final touchdown. The Rosetta mission was launched over a decade ago following eleven years of preparation and planning. Carried into space on an Ariane 5G+ rocket, Europe’s primary expendable launch system, the probe used the gravity of Mars and Earth to propel itself into deep space where it hibernated for two years while it caught up with its target comet. Awoken in early 2014, Rosetta began collecting information about Comet 67P even before launching the Philae lander, including the first ever recording of a comet’s “voice” – a strange, astral “song” picked up by Rosetta’s Plasma Consortium that you can listen to here. 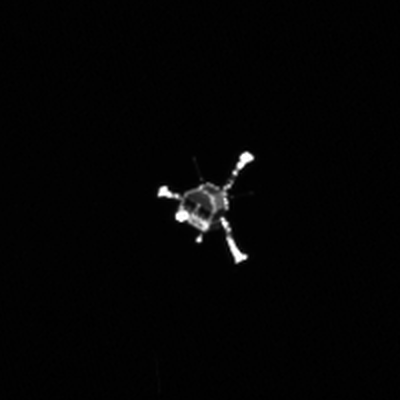 Image from Rosetta’s camera showing the Philae lander detached, with legs and antennas deployed, heading toward the comet. After landing, Philae bounced several times and traveled more than a kilometer before finally settling relatively close to the intended touch down site where it will now stay and transmit data until it either runs out of energy or suffers mechanical failure. The lander itself is equipped with an array of sensors designed to answer questions about the presence of water on comets and the role such bodies may have played in the origins of life on Earth. 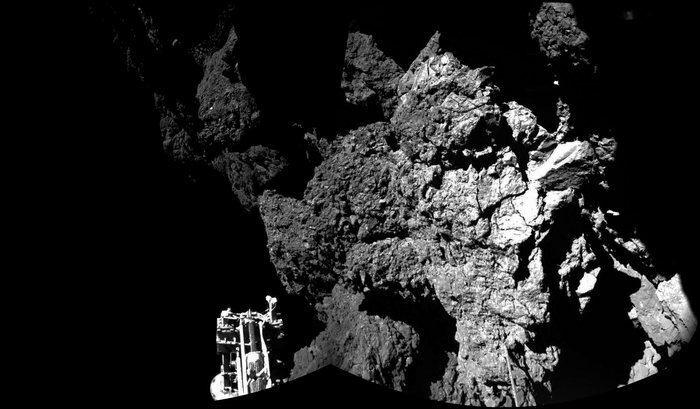 Philae’s parting image of Rosetta, taken shortly after separation looks for all the world like a still from a science fiction film. ESA is ‘Europe’s gateway to space’, an intergovernmental organization with twenty member states including France, Germany, Italy, Spain and the UK. 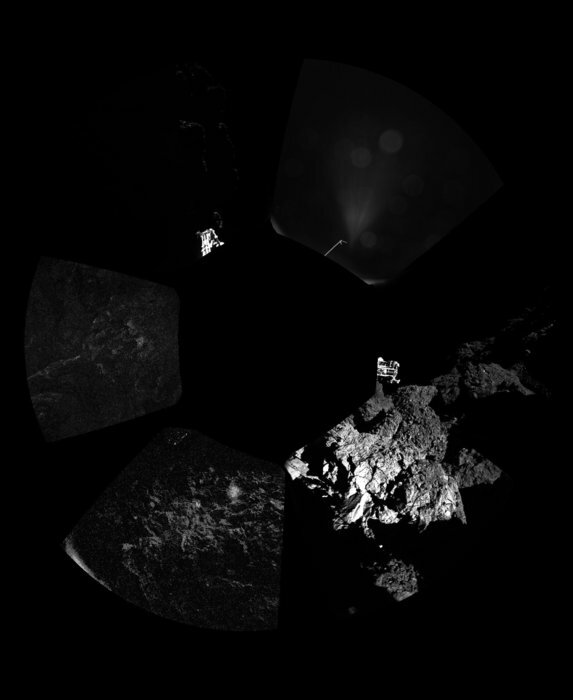 As human ambition in space becomes ever grander, missions such as Rosetta are increasingly beyond the scope of single nations and can only be achieved by a pooling of international resources. ESA’s mission, to expand human understanding and exploration of the cosmos, is a powerful and inspiring force for global cooperation, building peace as well as dreams. So why am I blogging about all of this? Well, aside from the fact that we just witnessed a little bit of history in the making and that missions like Rosetta have the potential to shed light on some of the most fundamental questions surrounding the existence, origins and future of humankind, I believe they can also be the inspirational glue that holds this planet together. Seriously. In a world of increasing wealth disparity, where millions face hunger and disease while an elite few bask in a level of luxury systematical unattainable to the rest, looking to space, to the vastness of the cosmos and the fragility of our place within it, brings a level of perspective that, I believe has potentially healing properties. Also, it’s just freaking cool! As a writer and a sci-fi nerd this stuff makes my spine tingle. 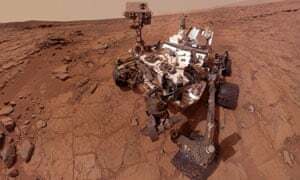 I mean come on people – we have landed a robot on a comet and we have rovers on Mars! 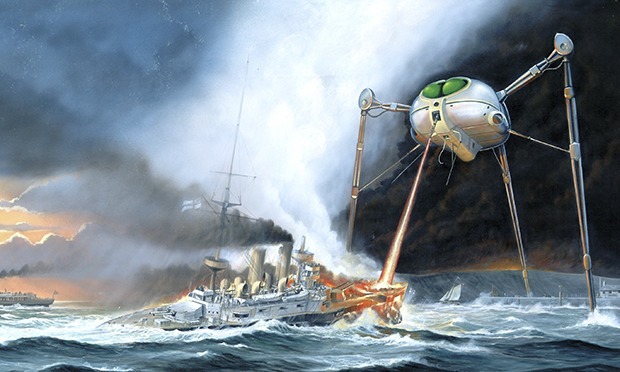 We’re living in the future, and what’s so great about all the best, uplifting sci-fi visions of tomorrow? In addition to traveling amongst the stars, to teleportation and warp speed, in the bravest, purest visions of human potential we have built an egalitarian society free of injustice, hunger, war and disease. I know Rosetta will not bring us any of those things, but it is a scientific success born of dreams, and if it inspires any of us just a little bit closer toward some of these lofty ideals, who knows what tomorrow may bring?